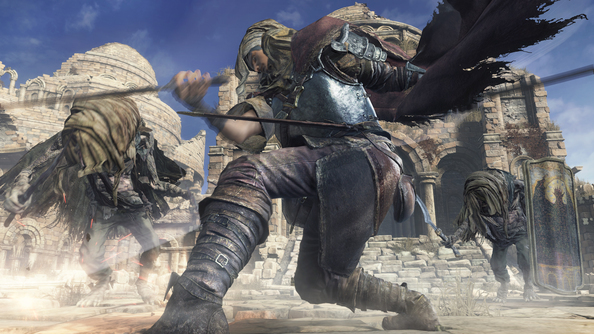 If its opening hours are anything to go by, Dark Souls III is a game that makes attempts to sideline its largely decent but ultimately not exemplary predecessor. Because for all of its qualities – not least of all it’s excellent DLC – when looked back upon dispassionately, DSII begins to feel like the non-Miyazaki sequel that it was, and something of a reminder that this is now very much a series; a franchisable money-maker that has surpassed cult status and is perhaps too valuable to end after a third outing, whatever noises its creators have been making thus far. 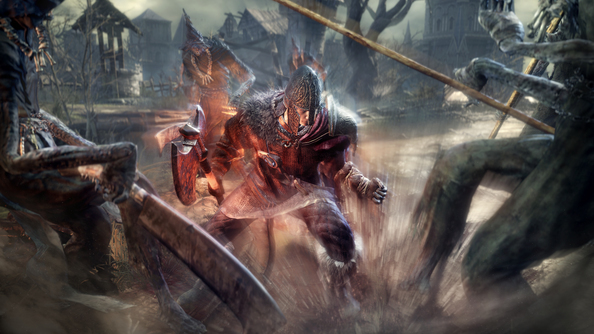 Despite all that, Dark Souls III’s early stages suggest that creator and director Hidetaka Miyazaki is here to create a decidedly familiar Souls game, but an experience that’s more considered and ultimately more standout than the series’ sudden succession of sequels would suggest. Oo-la-la. Whether or not he’s back because he wants to be or because he has to be – think the ‘will-he won’t-he’ of a contractually obliged post-Spectre Daniel Craig, minus the biceps – Miyazaki is fully aware that he is cheekily and deliberately blurring the lines between his two greatest creations, with what he’s serving up here feeling more than a little reminiscent of last year’s Bloodborne. The elusive creator is surprisingly candid during a short presentation at the altar of a Hamburgian church and, as flames project onto the ornate ceiling above while an organ player sits in the rafters bellowing out dissonant orchestral tunes (genuinely), even refers to the “frustration” from publisher Namco Bandai that Dark Souls III, now one of their key IPs, copies so liberally from Sony’s PS4 exclusive. Unsurprisingly, Dark Souls III’s greatest secrets remain untold, but that’s to be expected from a designer so committed to keeping players’ minds busy for years. What’s clear is Miyazaki’s directorial intention: he will reuse and refine his best design ideas, even if it results in accusations of self-plagiarism and a risk of staleness. That isn’t to say that this is a carbon copy, but the director has transposed the foundations of the Souls series several times now, altering bits and pieces as he goes and subsequently shifting our expectations ever so slightly, without transforming the experience. 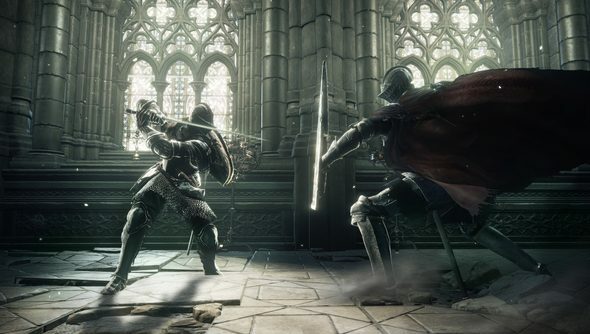 Souls III remains familiar from the off, albeit now slightly faster and more aggressive, and still retains many of the series’ infamous tropes – it’s tough, unforgiving, and steeped in mystery. The increase in pace is an interesting change, serving to get you out from behind your shield more than you might be used to, and giving combat a scrappier, messier feel. After a characteristically vague cutscene lays out cryptic clues pointing to the game’s overarching events, where you, ‘the Unkindled’, seek an infamous few known as the Lords of Cinder, Dark Souls III’s immediately presents grander locations than we’ve seen so early on in the series. FromSoft has always possessed an incredible ability to design worlds in which you can see places off in the distance – cool landmarks that you know that you’re going to repeatedly die inside – and this threequel is absolutely no different. Traipsing first through the game’s first area, Cemetery of Ash – a tight wooded maze with several different nooks – the playable space quickly opens up, revealing a series of cliffside precipices and a distant Babel-ite tower, all set in the foreground of a snow-capped mountain range. The sense of scope is matched by the game’s density, another immediate comparison to the micro detail of 2015’s Bloodborne. From the Firelink Shrine – now a very different sanctuary to the iconic one you’ve seen before, complete with multi layered nooks and crannies that host several different NPCs – to the already-demoed High Wall of Lothric, and on to the newly revealed Undead Settlement, each of the demo’s areas are packed with environmental flourish. 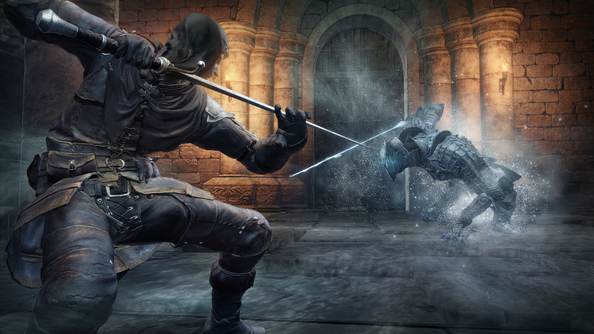 Exploring the High Wall genuinely feels like you’re scaling the battlements, towers and lower levels of a huge fortress, while the Undead Settlement feels frighteningly similar to Bloodborne’s Hemwick Charnel Lane, complete with rickety bridges and wooden structures filled with the undead. There are huge staircases, cathedrals and ramparts, and each area pops with a real vividness, but none of it quite escapes that well-trodden Souls vibe. The large open spaces lead to tight corridors with impasses in the form of hard-as-nails mini-bosses – we found an extremely tough NPC humanoid blocking off an optional shortcut – and the environment worms around on itself so much you need to pay attention almost constantly else you risk getting lost. It doesn’t feel quite as interconnected as the original Dark Souls, and there’s a reliance on teleportation from very early on, but the game strikes a nice balance between cool shortcut discoveries that link up previously separated parts of the map, and an impressive overall scale. It’s not long before you’ve discovered your first proper boss – in this case, a knight, crouched dormant, brought to life when you rip out the sword lodged in his chest. 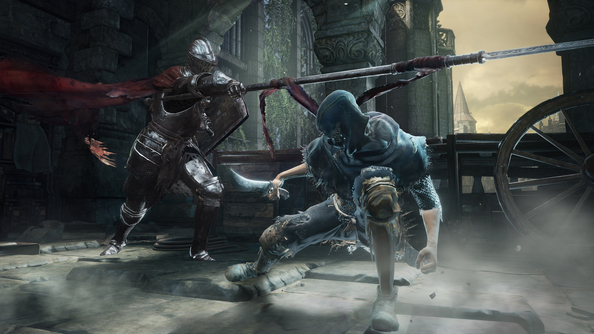 Before the demo, Miyazaki introduced Souls III’s new sword arts “skills”, but while playing the game these new abilities don’t feel like major overhauls. They are essentially weapon-specific abilities that give you certain moves – a dagger lets you quick-step, while a greatsword does a huge swing etc – and the new magic system adds a mana bar just below your health, along with extra kinds of flasks, the Ash Estus, to refill it. Cleverly, if you’re not using the magic system in your build, you can allot the flasks to either health or mana to fit your needs. By the end of the demo, two bosses lay slain, the second of which – an armoured icy creature called Vordt of the Boreal Valley – fights similarly to Bloodborne’s Blood Starved Beast, lashing out with intense flurries of attacks that took a fair bit of practice to counteract. A third and presumably final demo boss – a colossal, earth-smashing Ent with rotted eggs falling out of its abdomen – still stands, smirking at my attempts to best it. Progression feels steady; there’s nothing like the indiscriminate rush of Dark Souls II, where nondescript boss after another tried to take you down. 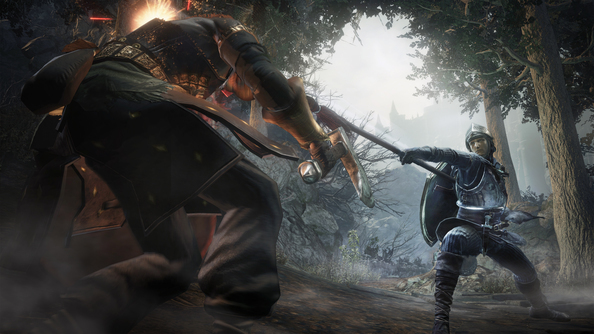 Exactly why you’re seeking the Lords of Cinder, and to what end, is still unclear at this stage – Miyazaki hates revealing his cards early – but it’s clear that Souls III is a hybrid of ideas, both familiar and fresh, and that it contains direct ties to the original game, something that’s sure to get the lore glands pumping among Souls fans everywhere. It’s these thematic and narrative ties that have the ability to make or break Dark Souls III, rendering it either another notch on the franchise bedpost, or a wonderful exploration of Miyazaki’s best ideas. Exactly How and Why it all interlinks? Only Miyazaki knows that for certain.